AC Milan tickets are extremely popular and in high demand. Associazione Calcio Milan, referred to as A.C. Milan is an Italian football club based in Milan, Lombardy that plays in Serie A league. At GoSportsTickets.com we sell all AC Milan tickets including the most popular matches so called “Sold out” games. AC Milan is the most successful club in world football in terms of international trophies, with 18 officially recognized UEFA and FIFA titles. Milan has won four world titles, more than any other club in the world, having won the Intercontinental Cup three times and the FIFA Club World Cup once. Milan also won the European Cup/Champions League on seven occasions. They also won the UEFA Super Cup a record five times and the Cup Winners' Cup twice. Milan won every major competition in which it has competed. 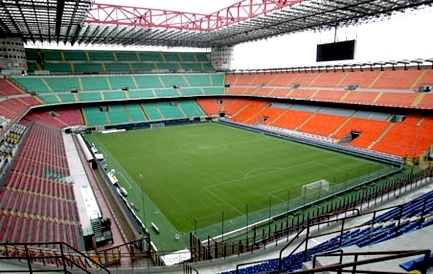 Milan's home games are played at San Siro, also known as the Stadio Giuseppe Meazza. (capacity of 80,018). We carry a large selection of AC Milan tickets, booking AC Milan tickets is very easy, simple and fast. Don’t miss out the great excitement Buy now your AC Milan Football Tickets and join the fun. .Don't miss the amazing experience of seeing the behind the scenes of Stadio Giuseppe Meazza (San Siro) historical moments – check out our Stadio Giuseppe Meazza (San Siro) stadium tour tickets!